Henna tattoos winding around her hand, the fifth-grader Yusra Munir writes the word "different" into her spelling notebook. Her classmate Chloe Choi looks on intently, checking for mistakes. They are students at Griffeen Valley Educate Together national school in Lucan, in west Dublin. The four-year-old elementary school provides final proof that all in Ireland has changed, changed utterly. Children of 43 nationalities inhabit its classrooms. Posters hang in the hallway commemorating the end of Ramadan. A welcome sign in the front foyer is written in a multitude of languages. It is there out of necessity: At least 12 languages are spoken here. Change has come so quickly to places like Lucan that the government seems stuck in an endless game of catch-up. The strain of a fast growing and diversifying population is being felt directly in the classroom. Schools have opened practically overnight to handle the overflow of students, most all of them black. Griffeen Valley seems to offer up evidence of a thriving multicultural model, complete with many children from traditional Irish families. Yet fears persist that patchwork solutions in other schools will have lasting consequences for society. According to the 2006 census, 14 percent of Irish residents are foreign-born. Many young families have entered the country with the hope of providing a brighter future for their children in an affluent and stable country. While Ireland has maintained an "open door" policy to immigrants, poor planning in the dense suburbs outside Dublin and the nation's longstanding commitment to a faith-based education model have left many new residents on the margins of the education system. It remains unclear that the Irish government has the vision to accommodate them. "The battle for integration will be won and lost in the schools," Conor Lehihan, Ireland's minister of state for integration, said when he took the position in June. That is especially true in the boomtowns like Lucan, Castleknock and Balbriggan, where there are not enough schools and the competition to get in is intense. And in Ireland, one's religion can determine which school a child will attend. The Roman Catholic Church operates 98 percent of the state-run schools. When there are too many students to choose from, the church is entitled by law to prefer a Catholic student. That means that many Poles and other East European immigrants get in. Others do not, and often they are black. 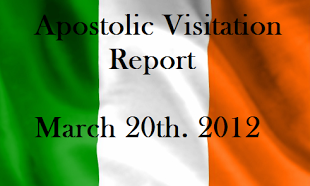 The church is uncomfortable with this role in a changing Ireland, yet the tradition holds. With such an influx, Balbriggan, northeast of Lucan, found itself scrambling to find places for 100 students when the school year began in September. Most of them were of African descent. The government turned to Educate Together, a nonprofit company that gets government money to operate 43 multi-denominational elementary schools in Ireland, and asked it to open an "emergency" school in Balbriggan in just two weeks. "The Catholic school said I should not even drop in my child's name if I don't have a baptism form," said Dupe Lawal, a Nigerian caretaker whose daughter started pre-school at Bracken. Dubbed Ireland's first "black" school by the media, the Bracken school has sparked fears of ghettos in Irish education. "What we have is the intersection of racial and religious discrimination," said Paul Rowe, chief executive of Educate Together. "If there is discrimination in religious allotment, it is inevitable that racial discrimination will emerge." The crunch in school places is a direct byproduct of Ireland's flawed planning for population growth. One recent study proposed that north Dublin alone needed 60 more elementary schools. "Huge housing estates have been given planning permission without the provision of new schools," Rowe said. "It is inevitable that there'll be a shortage of space." In the wake of the controversy, the church has distanced itself from the government's education policy, stating in a recent policy paper that it has "no desire to be the sole provider of education for whole communities." Yet Ireland's Department of Education has continued to justify the current policy, even after two complaints of discrimination by the UN Council of Europe. Its answer to the urgent need for a different type of school is one that will be opened on a pilot basis next September. One community school, with no ties to the church, will be opened in Diswellstown, near Castleknock in north Dublin, another area that has experienced a population surge. One compulsory feature of the school will be a period where students are divided up along religious lines and given faith-specific education, with Islam for Muslim students, Hinduism for Hindu students and so on. Critics say this plan is piecemeal and inadequate and wonder how long the government can go without bringing about sweeping changes. "The sands of time are shifting beneath their feet," said Tomás O Dúilang, Griffeen Valley's principal. "You can't have 98 percent of the schools Catholic when 48 percent of students" in some places are non-Catholic. Educate Together has applied to open 20 new schools in the next year alone, a sign of the staggering pace of change. It is not only immigrant families who are applying. While many "lapsed" Catholics are sending their children to the local church-run school when no alternative exists, more and more are choosing Educate Together schools. Griffeen Valley, for instance, has a 50-50 ratio between students born in Ireland and born outside of it. "We're gradually becoming mainstream," O'Dúilang said. The Griffeen Valley school suggests that integration is achievable, if handled deftly. The school is bright and modern. Religious festivals like Hanukkah, Christmas, Diwali and Ramadan are all marked and respected. "This is a school that celebrates all religions and no religions," O'Dúilang says. Equally important is the individual experiences each student brings to the classroom. One 10-year-old, Zheen Abdulla, matter-of-factly describes the summers and winters in her native Kurdistan and the reason her parents left their native land seven years ago: Saddam Hussein. "One thing I found out right away," O'Dúilang says, "you don't call it Iraq."